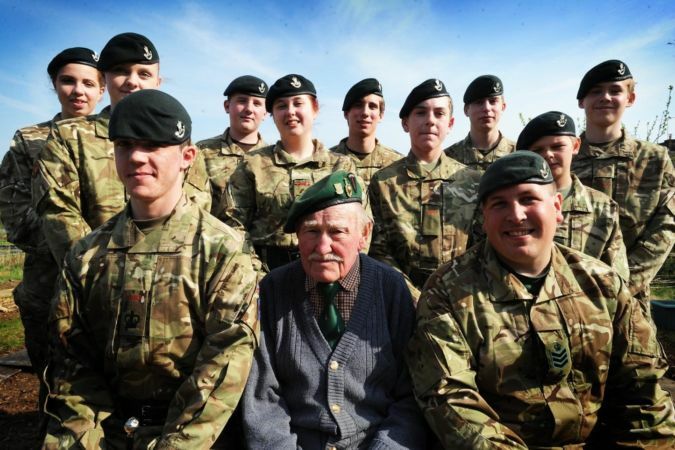 Cadets from the Witney detachment of Oxfordshire ACF leapt to action to help a 91-year-old D-Day veteran facing eviction from his treasured allotment. Patrick Churchill, was a radio operator with the Royal Marine Armoured Support regiment who stormed Juno Beach on June 6, 1944. The veteran faced eviction from his treasured allotment on Kingsfield Crescent by Witney Allotment Association because it wasn’t worked often enough. The Association said Mr Churchill could continue to use the allotment he has dug for 20 years, but that they would inspect it every month. Cadets from the Witney Detachment of the Oxfordshire Army Cadet Force sprung into action by picking up spades and forks and donned gardening gloves to help tidy the allotment and plant new vegetables, trees and bushes. Mr Churchill said: “I think it’s wonderful they are helping me out, but they will learn something from it too. “The thing about the armed forces is that you make friends with whoever you serve with and they are with you for the rest of your lives, so they will be learning that." Colour Sergeant Michael Bennett, 30, of Oxfordshire Battalion The Rifles, Army Cadet Force, said: “The cadets have come to lend their support. Cadet Kieran King, 18, added: “It’s especially important to give something back after all he’s done for us. “We’re going to try to turn it into a community project and help him out over the longer term,” he added. The story was reported by the Whitney Gazette and by BBC1 One Show at 1900 on 21 April 2015 (click on the link and scroll to three minutes in).